Russell's book represents the culmination of over a decade of work, but for sake of brevity this review will take slightly less time to produce than it took for this book to be made. We will begin with a note that this is not meant to be an introductory text so only one already familiar with the subject would get the full benefits from its pages. I do hope that this represents the latest mainstream trend in the study of Free Will, as it politely casts rightful doubt on many positions that have not improved in quality for at least several generations. His position is stated to be a kind of 'critical compatibilism' (that is, both Free Will and determinism do exist in some degree together). Russell does spends considerable time showing us how most positions one takes on the topic of Free Will is not without error, so comes to his conclusion from the result of knowing what positions work and crafting something that makes sense from that. I am not so keen on a middle ground, either the Will is free or it is not (just as in cases on free-speech, we can give our opinions on matters freely or we cannot), so as a general premise I would not support this position posited by Russell. There will always be mysteries to why we made the decisions we made, but such is the nature of a closed loop universe. A closed loop universe means that the output of a self-feedback loop will always remain unpredictable. The final analysis is that any notion of Free Will (generally agreed upon that this is defined as human action without influence from external sources) is unfalsifiable. Because we are philosophers, we cannot just abandon it at that so we delve further into the topic in an effort to lessen the myopia on the subject. This is why Russell finds it so difficult to properly peg a proper term for his position, because there are no fool-proof positions to take (even skepticism). Indeed, a central effort of this book is a struggle to find a name for the right position to take on the topic of Free Will. In reality, all he needed to have done was separate the correct from the incorrect conclusions of all points and leave the effort of naming what is left to his disciples – but this is a minor point. Russell touches on some very important points in his work, namely that the criticism against Determinism stems mostly from a standpoint that acknowledging the fact that our thoughts and actions are determined by external forces is too painful a reality to accept. We 'feel' free, therefore our feelings must be correct. Unfortunately, personal feelings are not a source of empirical evidence but merely a symptom of something else. If I were to point to the best part of this book, is that to dispel the confusion around determinism, and especially it's unfortunate association to fatalism. People associate determinism with some kind of nightmarish realm of existence where we are puppets of some force with goals that lie outside our personal interests. In fact, it is just how the world works, so if determinism is nightmarish – then welcome to the nightmare. The way we ought to slide ourselves into accepting determinism is to understand that even though all our actions are determined by outside forces, this does not mean that our actions do not influence the world around us, which do sometimes work in our favor. Think of why a farmer plants seeds in the spring – yes all kinds of terrible things could happen to prevent the growth of the seeds (drought, blight or insects), but if the farmer had never bothered to plant the seeds then nothing would have ever grown. We might be rats in a cage, but at least we have some movement to wander around that cage. On the other hand, something is not true just because we believe in it. The best we can do is proceed with belief then process and determine the truth with reason. If we find ourselves lost, or that belief has us going in circles with no end in sight, then perhaps we need to rethink the quality of our beliefs. This directly applies to the Free Will debate – we may believe in Free Will because we feel like it exists, but it has been several centuries now and there still has been no empirical evidence brought forward to support this idea. Waiting for proof of Free Will is like being stood up for a date – when will the time come when we realize no proof is coming, or that the other person just isn't showing up? Perhaps it is time we rethink our axioms. It was enjoyable to rediscover the ideas held by the previous titans of philosophy, especially the ideas from Hume. Freedom of will was linked with the existence of the will. Since we have done things before because we wanted to do it (we willed it to happen), meant that Free Will existed. If only it were that easy, and with the work of the Late Enlightenment thinkers such as Heidegger or Sartre, we realize that the Will itself is a much a product of society as our taste in music. All because a will exists does not mean that will is free. The essay citing the life of Mozart was well done. It rightly covered the idea that because Mozart produced brilliant pieces of art did not mean that his musical genius blossomed in a vacuum. He produced great pieces of art, for his time (it is irrelevant that later generations enjoyed his music) and situation. Had Mozart created a gangster-rap musical in 18thcentury Germany, instead of Classical music like what he was surrounded with, then this would be an oddity that would have warranted further investigation. Mozart's creations were quite common in type for his culture, then it stands to reason that he had some kind of inspiration from his surroundings. The only thing uncommon was the quality of this work, so that still is worthy of praise even though it is understandable how he made his art. Talent also ought not to be confused with ideas of luck, or the Infinite monkey theorem (a thousand monkeys typing on a thousand typewriters for a thousand years would eventually produce a Shakespearian novel) – that it was purely coincidental that Mozart was so good at what he did. Russell did a good job at telling us that what Mozart did can be explained within a determinist standpoint, and still leave room to praise him for his accomplishments. Another main theme throughout this work was on responsibility. Russell forgets that responsibility has absolutely nothing to do with Free Will because as is forced on us by society, rather than we actively seeking and accepting it (for example, parents are responsible for the care of their children, whether they like it or not). What is important here, and what Russell does a good job on, is discussing whether or not one follows through with the reasonable effort involved in fulfilling their responsibility. Prisons are full of people who did not fulfill their responsibilities. That being said, whether or not that society is just we need to determine if that which was imposed on the individual was just. This has all kinds of legal and ethical considerations, of which I do not wish to get involved too deeply here, but suffice it to say that Russell does a fine job of suggesting that placing blame for responsibility on someone who had that responsibility forced on them is not wrong in of itself. We place blame because it is the most convenient thing to do – if a grown man robs a bank we do not issue an arrest warrant for that man's third grade teacher who beat him with a ruler. The world is simply too complex for us to fairly place blame where it is due, so we cut a few corners and act as if there were only one person to blame for one act. 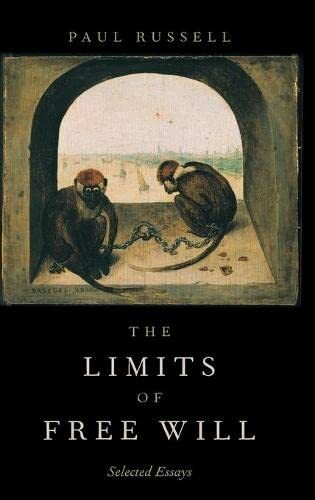 All in all, this is a decent book that (hopefully) represents the future of the philosophical study of Free Will. I would not recommend this book to beginners on the subject, but would make a valuable contribution to the knowledgebase for those working in the mental health field, law/law-enforcement or philosophers with an interest in the subject. Hans Krauch is a graduate student at Sofia University "St.Kliment Ohridsky", Faculty of Philosophy.